You can be like every other tourist in Italy — zipping from Rome down to Naples on the fast train, taking the obligatory look around Pompeii, circling back up to Tuscany, continuing onto Venice — or you can actually look at a map and consider what else lo Stivale has to offer. 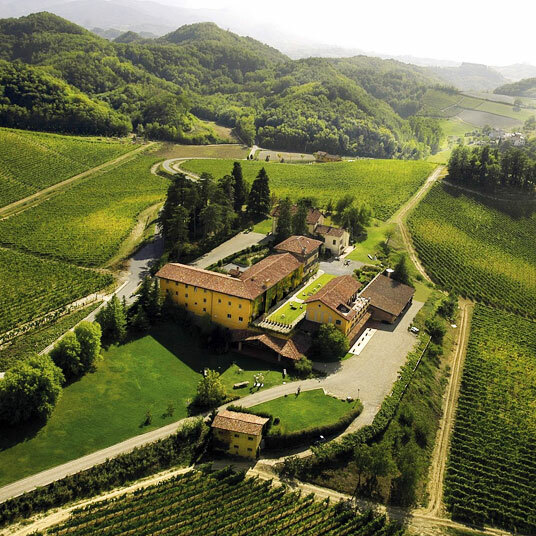 There’s Piedmont, for instance, the northwestern region known for Barolo wine and rare white truffles, not to mention spectacular mountain scenery. Albergo L’Ostelliere is located here, in the tiny village of Monterotondo di Gavi. It’s not the kind of place, in other words, where you’re likely to have much contact with the tour-bus crowd. The hotel is located inside a restored 17th-century farmhouse that’s part of a larger resort. “Resort,” in this case, not referring to an all-inclusive vacation, but the kind of classic Italian resort town that’s built around wine or healing waters. You guessed correctly: it’s the former. The picture-perfect vineyards of the Villa Sparina winery roll out along the hills around Albergo L’Ostelliere, ensuring sight-worthy views from the guest rooms, and a glass that’s always at least half-full of Barbera. Inside, the look is simple but elegant — they’re not reinventing the wheel, and why should they bother? There’s sumptuous drapery and European antiques, plus satellite TVs, wi-fi, and mini-fridges so you can keep your wine at a cool 55°F while you’re out horseback riding or foraging for truffles. 11 of the 33 rooms are named after the wine-making villages of Gavi; the top-end suite is called Monterotondo. Most of the pleasures of the place are found outside, of course. The hotel arranges winery tours, hikes, excursions to nearby castles, and the like. There’s a golf course practically within walking distance, and Italy’s biggest outlet mall (!) is close by as well. After a day out in the countryside, come back to Albergo L’Ostelliere for a dip in the outdoor pool and a leisurely dinner at the Michelin-starred La Gallina, where Piedmontese and Ligurian dishes are served on a lovely terrace in summertime. The vegetables come from the nearby garden and the wine is produced onsite — eating local, Italian style. Albergo L'Ostelliere is an hour’s drive from Milan and forty-five minutes’ drive from Genoa. Pets are allowed (charges may apply). Baby cots and extra beds are available on request for a supplement. Please contact CustomerService@TabletHotels.com for assistance.